Investing in a kitchen remodel for your home in the Frisco, Texas, area, can be a wise decision. In doing so, you can customize the space to meet your unique aesthetic preferences and needs, which can make your kitchen more enjoyable to cook and spend time in than ever before. From replacing the cabinets and countertops to increasing the square footage of the space, you’ll be able to turn your kitchen into the space you’ve always dreamed of having that provides beauty as well as functionality. In addition to updating the aesthetics and practicality of the space, a kitchen remodel can add value to your home, making the project a fantastic investment. Furthermore, in the event you want to sell your home, you can rest easy knowing that an updated kitchen is a great selling point and will likely impress potential buyers. 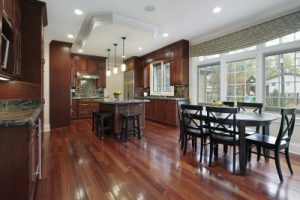 For professional kitchen remodeling services, look no further than the experienced specialists at Star Home Remodeling. Since 2007, we have been transforming our customers’ houses into their dream homes. From the design to the renovation, we can handle the entire project. When we begin the process, we’ll take the time to educate you about the wide selection of products and services we offer and make certain you have all of the information needed to make the best decisions. What’s more, we’ll be transparent and up front about the costs so that you stay under your budget and aren’t surprised by any fees down the road. We can also custom-curate the perfect products for your kitchen remodel. For instance, we can help you select beautiful and built-to-last countertops, cabinets, backsplashes, flooring, kitchen islands, sinks, lighting, and virtually any other product you’d like incorporated into the remodel. For more information about the kitchen remodel services we offer to homeowners throughout the Frisco, TX, area, contact Star Home Remodeling today. We’ll be happy to answer any questions you have.